My little girl wanted to dress up as the evil fairy witch, Maleficent, from Disney's latest Sleeping Beauty movie. I wasn't going to spend a small fortune buying a headpiece when it's something that can be made pretty easily. 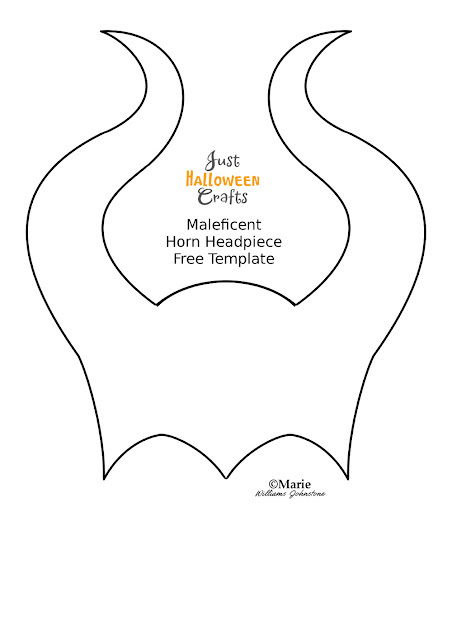 I drew up an outline for a pair of curved horns and am sharing them in a free printable Maleficent horn template for other parents out there to save and print off as well. You can even print these off just a little larger and use it to make an adult costume accessory as well. As well as the free printable you get on this page, I've also written a couple of tutorials on using this design to make up some easy Halloween costume accessories. Grab your printable and get the tutorials and how to info as well while you're here. Maleficent is best known for wearing black in the latest movie starring Angelina Jolie as the lead character. Any witch style dress is likely to be appropriate to wear. My daughter chose a costume dress in black and dark pink which looked good with the horns. Is this your favorite evil fairy Queen? I hope you've enjoyed reading my justhalloweencrafts page today, thanks for your visit. Let me know how you used this template in the comments below. Have fun with it.